Other than No Limit Texas Hold Em, there are many other forms of poker. This article is dedicated to forms of poker other than No Limit Texas Hold Em, and how to play each game. Like No Limit Texas Hold Em, Limit Hold Em is played with players being dealt 2 cards down, 5 community cards (Flop, Turn River) and 4 betting rounds. This is where the similarities end. Limit Hold Em is played with betting limits, unlike No Limit. In Limit Hold Em, players are allowed 1 call and 3 raises, which caps the action. So if the blinds are 50/100, player 1 can only call the 100. Player 2 can raise to 200, Player 3 can reraise to 300, and Player 4 can cap the action at 400. This means player 1 has to call 300, Player 2 has to call 200, and Player 3 has to call 100. Another major difference between No Limit and Limit is that in Limit Hold Em the betting limits change on the turn. In Limit Hold Em, when the blinds are 50/100, the minimum bet pre flop and on the flop is 100. This bet doubles on the turn and river to 200. The same 1 call and 3 raise max rule applies to all betting levels. Some things to keep in mind when playing Limit Hold Em are try to play premium hands and don’t try to play every hand. Just because it is a limit game doesn’t mean you should chase all your draws or play any 2 cards. You’ll go broke doing so. When you have a hand, bet! By allowing players to see free cards, you’re giving them the opportunity to win the hand by catching there card. A lot of people frown on playing Limit Hold Em because of their experiences playing in casinos. In low limit cash games at casino’s you will find a lot of loose players. They have to change their game in limit hold em tournaments because the blinds will increase regularly, making it impossible to play bad cards for a cheap price. Pot Limit Texas Hold Em is played just liked its no limit cousin, with the only difference is the maximum one can bet is the size of the pot. Lets say preflop the blinds are 50/100, and the there is 150 in the pot ( just the blinds) and player A bets the pot. In order to bet the pot, player A has to call the big blind, then bet the size of the pot. So player A’s total bet is 350, since he has to call the big blind. Lets say after the flop there is 1000 in the pot and player a wants to bet the pot. Player A only has to bet 1000 since there was no outstanding bet to call. Pot Limit games do allow players to go all in, but the pot has to be large to enough for a player to do so. Your position really affects how you play in Pot Limit games. If you bet the pot from 1st position, the bet is small enough not to scare anyone out. But a pot sized bet from the button will usually be enough to win the pot. Royal Hold Em is Texas Hold Em with a twist. Royal Hold Em is played with only 10’s, Jacks, Queens, Kings, and Aces. This game can be played with up to 6 players. Royal Hold Em can be played in any format, but it’s generally played as a limit game with a lot of action. Pineapple can be played 2 different ways; Pineapple and Crazy Pineapple. 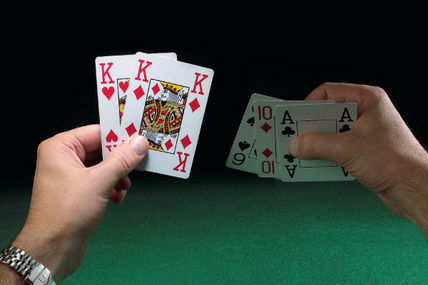 Both games are played like Texas Hold Em, except all players are dealt 3 cards instead of 2. In Pineapple, players must discard one of the 3 cards they were dealt before any betting occurs. In Crazy Pineapple, players play all 3 cards to the flop. One of the players hole cards must be discarded before any betting occurs on the flop. Omaha is a community game like Texas Hold Em, with a flop, turn and river. In Omaha, players are dealt 4 cards instead of 2, and thru out the whole hand players must use 2 of their hole cards at all times. Omaha can be played as either a limit game, or as a pot limit game, which it normally is played as. Some online card rooms offer it as a no limit game, but this defeats the true game itself. Omaha is one of the few games that a player can flop the nut straight and fold because of potentially bigger draws hitting. Lets say Player A flops the nut straight with 2 clubs on the board and bets the pot. Player B re bets the pot, and Player C re bets the pot. Player A can assume both Players B and C are on flush draws and fold his straight since if the 3rd club comes, he’s done for. Omaha is a game where players really have to read the board, looking for flush draws, and also full houses if the board happens to pair. Hand selection is very important too, since even less hands are really playable in Omaha because of how the game works. Ideally you’d want all cards to work together is some way, like pairs with hi connectors. AAJT double suited is the best starting hand for this reason. Omaha Hi/Lo is identical to Omaha, except the high hand wins half the pot and the low hand hand wins the other half. To win the low, players must have a qualifying hand with 5 cards under and 8, meaning that if your 5 cards are not 8 or less, your hand does not count for the low. Straights and flushes do not count against you for the low aspect, so the nut low is A2345. Omaha Hi/Lo is played as a limit game. Many online card rooms have Omaha Hi/Lo (or Omaha 8) where you can play it as a pot limit game or a no limit game. In the World Series Omaha 8 is played as a limit game. Ideally when playing Omaha 8 you want to win both the high and the low. It is not profitable to just chase just the high or low, especially in heads up play. In a four way pot chasing the low can be profitable, but not in heads up play. The best starting hand in Omaha 8 is AA23 double suited, since you have the best high with the Aces, and the you’re drawing to the nut low with either your A2, A3, or even your 23. 7 Card Stud and its cousins 7 Card Stud Hi/Lo and Razz are different then flop orientated games like Hold Em and Omaha. Players are dealt 2 cards down, then one card up. A round of betting occurs. The 4th card is dealt face up, with another round of betting afterwards. The same goes for the 5th and 6th cards as well. The 7th and final card is dealt face down. The betting is also different for 7 Card Stud and its cousins. For one, everyone has to ante. On 3rd street, the player with the lowest card showing has what’s called a bring in bet, meaning they have to either bet the bring in or the full amount. Stud games are limit games, so players can bet once and raise 3 times before betting is capped. On 3rd street and 4th street the bets are the lower limit, and on 5th, 6th, and 7th street the bets are the higher limit. Also, if a player has a pair showing on 4th street, they have the option of betting the higher limit right away. Lets say the limits are 50/100, with a 10 ante and a 20 bring in. All players have to ante the 10. On 3rd street, the player with the lowest card showing has to “bring in” the 20, or they have the option of completing it to 50. On 4th street, players can only bet 50 at a time, but if they have a pair showing they can bump it up to 100. From 5th street on, all players must bet at least 100. One of the key aspects to winning stud is that if you can’t beat what you can see, fold. If you have Kings down and someone has a pair of Aces showing, why keep betting into a hand that you know beats you? Sure you could hit trips and win, or hit 2 pair, but you don’t know if they have trip Aces or a bigger 2 pair already. Stud Hi/Lo (Or Stud 8) is identical to 7 Card Stud in its format and uses the same rules for Omaha 8. Razz is played just like 7 Card Stud, with one major difference. Razz is strictly a low game, and unlike Stud 8 or Omaha 8, there is no qualifying low hand. The lowest hand regardless wins. If Player A has a full house, and Player B has a straight flush, Player A wins the hand with a lower hand! Since straights and flushes don’t count against you, the nuts is A2345. Your hand strength is based on your 5 lowest cards. A2349 looks good, but its beat by 34567. Your starting hands should be low hands like A23, A34, 234, and so on. Razz is a game using reverse logic, since you’re trying to lose the hand. Although not as popular as it used to be, 5 Card Stud is one of the oldest poker variants. 5 Card Stud is played like its 7 card cousin, but its dealt one card down and 4 cards up. Players ante before any cards are dealt. The 1st card is dealt face down and the 2nd card is face face up. Whoever has the lowest card showing on 2nd street has the “bring in”. 3rd street is the last of the lower limit bets. All bets on 4th and 5th street are at the higher limit. With only 2 cards to play off of, starting hands in 5 card stud or a bit looser than 7 Card Stud. Ace high is often a good enough starting hand. Any pair is very playable. Playing for straights and flushes is not profitable since your odds of hitting runner runner runner are very slim. Although 5 Card Stud is supposed to be a limit game, it can be played as a no limit game. Anyone who has seen the movie “The Cincinnati Kid” can verify this. This applies to only cash games and not tournament formats. 5 Card Stud can also be played with other stipulations and considerations, such as wild cards, 2 down / 3 up, and so on. 5 Card draw is probably the first poker game people learn to play. There are many variants of this game, but the 2 most common are limit and no limit. In limit formats, players ante before any cards are dealt. Players are dealt 5 card face down. The 1st round of betting occurs, with players betting the lower of the limits. Generally a call and 3 raises is allowed. After this players draw, and the last round of betting occurs. Best hand wins the pot. 5 Card Draw has so many stipulations and considerations that the list goes on and on. Wild cards are very popular in 5 Card Draw. 2-7 Lowball and Ace – 5 Lowball are variations of 5 Card Draw, except these are low games. Both games can be played under any betting structure, but generally they are played no limit. Both games have 3 draws, thus they have 4 betting rounds, making these games full of action and money. Players will post a big blind and a small blind, and a betting round occurs after every draw. That’s where the similarities end and the differences begin. 2-7 Lowball, also known as Kansas City Lowball, is played with 23457 being the nut low. Straights and flushes count against you in 2-7 lowball, and Aces are considered high cards. This game is still played at the World Series Of Poker, and is considered a valued bracelet to own. There are plenty of poker games that can be mixed together to form another game. The most popular format is H.O.R.S.E., which is made up of 5 games: Hold Em, Omaha 8, Razz, Stud, and Stud 8 (The E in H.O.R.S.E. stands for the E in Stud 8). In H.O.R.S.E. all games are limit games, with Hold Em and Omaha 8 using and identical betting structure, and the Stud variants using an identical structure. Hold Em and Omaha can be combined to play a Pot Limit combination of the 2. Other variations include S.H.O.E (H.O.R.S.E.) without Razz, S.H.O., which is Stud, Hold Em, and Omaha, and S.H.O.R.E.D., which is H.O.R.S.E. with a draw game added, usually 2-7 Lowball.